The content of this article provides interesting history, facts and information about Roman Army. The Romans were essentially military in all their tastes and habits. Senators and nobles showed the greatest courage and skill in the most difficult campaigns. When they were at home great generals such as Antony, Caesar and Pompey were lazy and self-indulgent, but at the head of their legions they were capable of any privation and fatigue. Twenty-five Roman legions made the conquest of the known world, and retained that conquest for five hundred years. The Roman Army was one of the greatest armies that the world has ever seen. The Roman army was originally called Legio and this name, which dates to the foundation of Rome, continued down to the centuries. The Legion was therefore not equivalent to what we call a regiment, inasmuch as it contained troops of all arms, infantry, cavalry, and, when military engines were extensively employed, artillery also. The number of soldiers who, at different periods, were contained in a legion, does not appear to have been absolutely fixed, but to have varied within moderate limits. 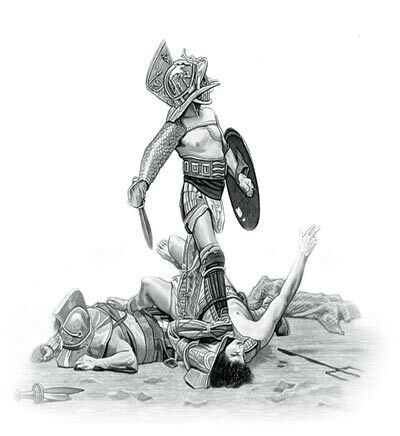 Under Romulus the legion contained 3000 foot-soldiers. From the expulsion of the Kings until the second year of the Second Punic War the regular number may be fixed at 4000 or 4200 infantry. From the latter period until the consulship of Marius the ordinary number was from 5000 to 5200. For some centuries after Marius the numbers varied from 5000 to 6200, generally approaching to the higher limit. Amid all the variations with regard to the infantry, 300 horsemen formed the regular complement of the legion. The organization of the legion differed at different periods. It was the spirit which animated the Roman legions, and the discipline to which they were inured that gave them their strength. The Roman Army was able to take strongly fortified cities such as Jerusalem which was defended by a triple wall, the most elaborate fortifications, and twenty-four thousand soldiers, besides the aid received from the citizens; and yet it fell in little more than four months before a Roman army of eighty thousand under Titus. The Roman military science that could reduce a place of such strength, in so short a time, without the aid of other artillery than the ancient catapult and battering-ram. The military science of the Romans was far superior to a feudal army of Europe during the Middle Ages. No armies ever won greater victories over superior numbers than the Roman, and no armies of their size ever retained in submission so vast an empire, and for so long a time. Two hundred thousand legionaries, and as many more auxiliaries, controlled diverse nations and powerful kingdoms and monarchies. The content of this Roman Army category in Ancient Rome provides free educational details, facts and information for reference and research for schools, colleges and homework. Refer to the Colosseum Sitemap for a comprehensive search on interesting different categories containing the history, facts and information about Ancient Rome. Just like the subject of Roman Army there is hardly a page of Roman history becoming a symbol of Rome, its society, culture and life.